Design by Alberto Meda, Franco Raggi and Denis Santachiara, 1988. The lamp is switched on with a simple movement of the hand, moving it onto its two equilibrium positions. 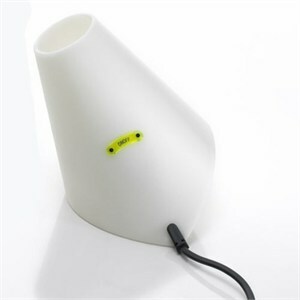 The thermoplastic material, which is soft and unbreakable, emits a functional and discreet light. A green LED indicates its whereabouts in the dark. Dimensions 6"W X 5"H. Uses 1 X 40W 120V E12 (candelabra base) G16.5 incandescent lamp (not included).